(I know this review has been out for more than a week but I wanted to bring our attention back to these two movies. Its important that we support works by Tibetans in Tibet. They are able to tell us stories, directly (not through exiles or Tibet-NGOs) about Tibetans in Tibet through creative projects such as the following. Efforts like these provide us with accessible and inclusive mediums, drenched in meanings, that can offer us a glimpse into the mind and lives of Tibetans in Tibet. Told to us by Tibetans in Tibet. No middle man needed. Check your local Art House Cinema for these movies, if not, request it. They will most likely oblige. 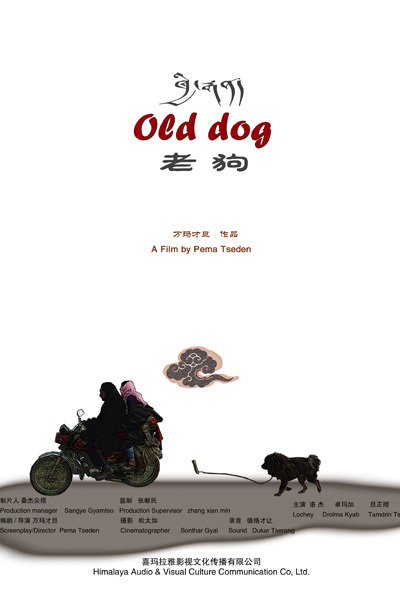 Pema Tseden’s “Old Dog” (Khyi rgan) opens with a handsome Tibetan youth riding into a town on his motorbike with an aged, shaggy dog tied to a chain. The youth looks virile and has a strong bodily presence on the screen, but we learn later in the film that he is impotent [reminiscent of Joan Chen’s depiction of a Tibetan man during the Cultural Revolution in “Xiuxiu – The Sent Down Girl”]. “Old Dog” is about the emasculation of body and space in the guise of progress and development. The film deals with the encroachment and destabilizing effect on Tibetan – or perhaps any – culture [not of the Cultural Revolution but] of China’s economic transformation. The film draws from contemporary history by situating the story in the sudden emergence of a feverish appetite among China’s nouveau riche for the mastiffs owned by Tibetan nomads, such that recently a mastiff named Hong Dong sold in China for $1.5 million. Gonbo sells the dog, but we learn that he has done it without his father’s approval, because, he argues, “it is better to get some money before the dog gets stolen.” But once the father discovers this, he goes to the town himself to recover the dog, which he has raised for 12 years and is deeply pained to be parted from. The father draws on Tibetan tradition, according to which it is taboo to use dogs as a commodity or to allow them to be bought and sold. “You don’t look like your father – your face doesn’t even resemble his”, he tells the dealer, whose father had been a hunter famous for having raised twelve mastiffs. Sonthar Gyal is the cinematographer for “Old Dog” and worked with Pema Tseden on his previous films, making them two of the leading figures in the first generation of independent Tibetan filmmakers. Now Sonthar Gyal has stepped back from the camera to make his directorial debut with “The Sun-Beaten Path” (Dbus lam gyi nyi ma), which has already won a major award this year – the Dragons & Tigers Award for a first time director at the Vancouver Film Festival. 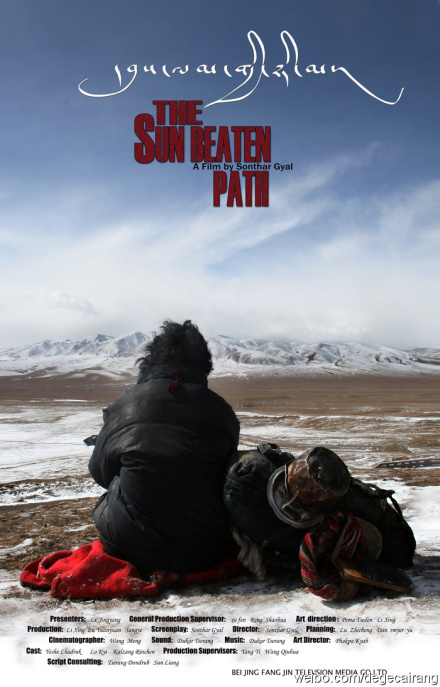 “The Sun-Beaten Path” is described as a road movie and a journey of self-discovery, which, like “Old Dog”, also uses amateur actors and location-shots in the director’s home area in the north-east of the Tibetan plateau. The film begins with Nyima, the young protagonist, pushing a motorbike off a cliff. The film tracks back and forth through a sequence of flashbacks to tell the story of what has happened, allowing us to see that Nyima is on a journey and is consumed with guilt. We discover that the motor-bike is at the source of this: while driving his mother back to the village on a farm tractor, she has been killed in an accident involving the bike. Nyima, blaming himself for the accident, is distraught and confused, his world in ruins around him, and by the time the film opens he has already completed an agonizing and self-imposed journey of expiation from his home to the Tibetan capital, Lhasa – a thousand miles or more – in which he has prostrated himself every three steps along the way. The film shows the final days of his return journey from Lhasa, hitching rides in trucks and buses or more often walking, as he nears his family home again. He hardly utters a word in the film, although we recognize his bewilderment and hardship through the changing complexion of his face as the sun bakes his skin. We discern that Nyima is uncertain about whether he is morally entitled to return to the family home, and at one point leaves a bus he had just boarded because it is going too fast. Along the way, he is befriended by an elderly man who senses that the youth is troubled but assumes that he has fallen out with a wife or girlfriend. Nyima at first rejects the old man’s companionship but, the old man, knowing the hardship of the road and that an inexperienced traveler can face death from the harshness of the sun and land, is undeterred and persists in trying to persuade Nyima to accept that his guilt has been sufficiently appeased. The film is both a story about the “kindness of a stranger” and discovery. As in “Old Dog”, an old man represents kindness, the strength of the past, and the accumulation of wisdom as a means of coping with the reality of the present. In “The Sun-Beaten Path”, most of the dialogue consists of the old man recounting his life experience to Nyima as a way of imparting advice and consolation. The boy appears not to be listening but we are made to realize that it is the old man who leads to Nyima’s reconciliation. “The Sun-Beaten Path” tells a simple story with depth and uses amateur actors to carry off the film in a naturalistic style. Both films rely not on speech to tell their stories but on the landscape and the long shot, giving their actors a powerful screen presence while positioning the audience as observers rather than participants. The whole theatre of action unravels before us without a particular vantage or point of focus, creating the filmic equivalent of what Pema Tseden has described as the aesthetic of a scroll painting or wall mural in which an entire story is depicted rather than a single scene or subject. In “Old Dog” and “The Sun-Beaten Path”, romantic visions of majestic snow-covered mountains or rolling alpine pastures are replaced by a harsh, relentless landscape against which the people battle to irk out living and within which the towns appear alien and incongruous. This provides the backdrop to the contemporary reality of transformation that is taking place on the Tibetan plateau. The two films tell stories of everyday existence which are distinctively Tibetan stories but which at the same time address universal themes of struggle and redemption without sentimentality or romanticization.